Taste test: These tortilla chips were quite tasty, with a tangy salsa taste and a good underlying whole grain tortilla taste, plus a hot aftertaste. 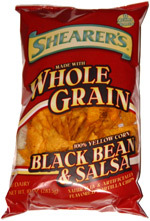 The whole grain corn flour made for a tasty chip, a nice change in taste from the usual tortilla chips. 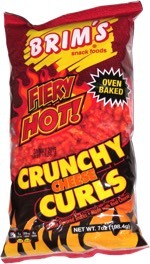 Some of the chips were not particularly crisp, but others had a good level of crispness. The chips were generally flat and kind of brittle, so probably wouldn't be that good for dipping, but there was enough flavor on them that you don't really need to dip. Smell test: Nice spicy salsa smell, and I think I detected some beans too.